Anish has been working in the security and cryptography area for the past 15 years, as a researcher and as a consultant. His first brush with payments systems was 15 years ago when he was involved in building a micropayments system for Ericsson. He has spent half his career researching cryptographic algorithms and protocols at three different research groups including Microsoft Research. 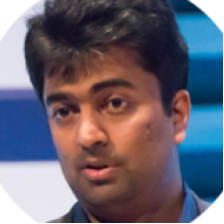 He has also worked as a strategy consultant for Accenture and Capgemini. Most recently he has been involved in the Blockchain ecosystem as one of the founding members of UKDCA . He is also on the advisory board for Ripple Labs , Adjoint, Chain of Things, IEET and EAVentures. These days he works for large UK bank where he is lead security architect of Blockchain initiatives. He is a regular speaker and contributor in both Cybersecurity and Blockchain.